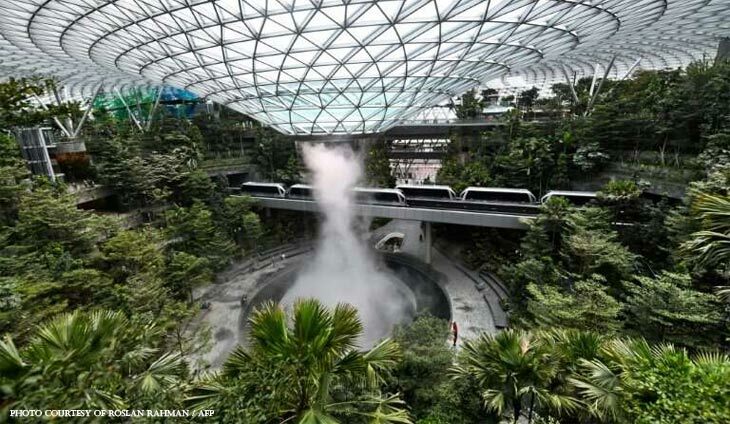 A 40-metre indoor waterfall cascading through a steel and glass dome is at the heart of a vast complex in Singapore’s main airport unveiled Thursday, part of the city-state’s fight for global flights. Reportedly built for a cool Sg$1.7 billion ($1.25 billion), the “Jewel” centre has gardens growing over four storeys, as well as 280 retail and food outlets, a hotel and cinema. It links to three of the airport’s terminals. But analysts were sceptical the 135,700 square metre (1.4 million square feet) complex would be a hit with transiting passengers — immigration has to be cleared to reach it and Changi airport already has high standard facilities. It is part of efforts by Changi — the world’s seventh busiest airport for international traffic — to attract long-haul travellers over other hubs such as Hong Kong and Dubai.